Overview - From Academy Award® nominated writer/director Kenneth Lonergan (You Can Count On Me) comes a stirring drama Rolling Stone calls “a film of rare beauty and shocking gravity.” Anna Paquin, Matt Damon and Mark Ruffalo lead a celebrated cast in the story of a Manhattan teenager whose life is profoundly altered after witnessing a terrible accident. Experience an emotional teen’s extraordinary journey to set things right as her innocent ideals come crashing against the harsh realities of the adult world. It’s an “extraordinarily ambitious film,” raves Time Magazine. Six years. That's how long it took for Kenneth Lonergan's 'You Can Count on Me' follow-up to finally hit theaters. First shot in 2005, the film entered post-production hell when it was the subject of several lawsuits dealing with budgetary concerns and editing delays. Finally, in 2011 a truncated (but director approved) version of the movie finally hit theaters, and now the film make its way to Blu-ray. So, was it worth the wait? Is the movie an unfairly mistreated masterpiece, or a disaster that was rightfully hidden? Well, as it turns out, the answer is… neither. A privileged Manhattan teenager, Lisa (Anna Paquin), is involved in a terrible accident. Haunted by the consequences of her actions, she is slowly overcome with guilt and finds little solace in the adults she seeks guidance from. As the usual pressures of being a confused adolescent pile up over her already shaky state of mind, Lisa decides to take action. Unable to hide the truth any longer, she sets out to make amends, but numerous obstacles aim to stand between her and justice. There really is a lot to admire about Lonergan's direction and script. The filmmaker creates an effective cinematic mood and does a solid job of enhancing the story through occasional stylistic touches (slow motion, for instance). Several conversations hit upon deep themes and carry an honest, almost confessional air. Anna Paquin also turns in a powerful performance, and though mostly underutilized, the impressive ensemble (which includes J. Smith-Cameron, Mark Ruffalo, Matt Damon, Mathew Broderick, and Jean Reno) are good in the time they are given. Unfortunately, these positive aspects are marred by a dragging pace, disjointed structure, and a tendency toward self-indulgence. At first, I was quite drawn in by the somber narrative and immediately invested in Lisa's plight. Scenes focused on her rocky family life, risky adolescent behavior, and classroom interactions are all fairly interesting, but as the runtime slowly plods along, these various pieces start to feel more and more disconnected. Similarly, a subplot involving Lisa's mother (J. Smith Cameron) and her new boyfriend (Jean Reno) is fine on its own, but often feels more like a distraction than an organic piece of the story. The second half of the film places a heavy emphasis on legal maneuvering as Lisa attempts to right a wrong, and while this makes sense from a narrative perspective, the logistical conversations begin to take away from the personal drama. Lisa's journey starts to meander, and the script loses a sense of momentum as the plot becomes stagnant and disorganized. The film is so packed with competing ideas and themes, that it lacks focus. Concepts dealing with grief, guilt, justice, self-centeredness, and pretension are all touched upon to some degree, and various classroom debates on political or philosophical issues add even more to an already overcrowded pot. Lonergan clearly has a lot to say, and in individual snippets there really are some interesting observations, but the whole thing just becomes a jumbled mess of underdeveloped ideas and weepy drama. Characters are constantly pouring out their hearts, and while there is certainly a lot of talking and yelling, at the end of the day, no one really says anything. Likewise, the constant screaming, crying, and ambiguous glances become excessive, and all of the gloomy emotions start to feel artificial and calculated. The director seems to go out of his way to try and engender a "realistic" cadence in the characters' conversations, but this mostly backfires. Odd diversions and awkward digressions pop up in a few exchanges, and though ordinarily this is something I might actually admire, here it just feels forced and unnatural. At times, the narrative and visual style become borderline self-indulgent, which is especially troubling, because criticism of self-indulgence is one of the film's major themes. Uneven and rather dull, 'Margaret' has moments of greatness but gradually collapses in on itself. Despite some occasionally insightful writing and directing, the film's emotionally draining drama can feel calculated and affected. Individual scenes are quite powerful, but when pieced together the story lacks direction, aimlessly going in circles. Lonergan has so much to say, that he ends up saying very little, and what is said, is sadly diminished by a faintly self-important air. All of this criticism might make it seem like 'Margaret' isn't a worthwhile effort, but honestly, I still think that it is. The performances are strong (when they aren't trying too hard to be "natural") and the film's cathartic ending is moving, despite the occasionally muddled, listless storytelling that gets us there. If nothing else, the material is refreshingly ambitious, and while the finished product is neither a masterpiece nor a disaster, it is an interesting effort all the same. 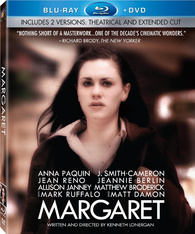 20th Century Fox brings 'Margaret' to Blu-ray on a BD-50 disc packaged in a keepcase with a cardboard slipcover. An extra DVD disc is also included that houses an extended 186 minute version of the film in standard definition. After some logos and warnings the disc transitions to a standard menu. The packaging indicates that the release is region A coded. The movie is provided with a 1080p/AVC MPEG-4 transfer in the 1.85:1 aspect ratio. Though quite impressive in many respects, the video is a little uneven. The source print is in excellent condition and features a moderate layer of richly textured grain. Clarity is often good, offering nice fine details, though some shots are softer than others. Colors can be very striking, with extremely deep, vivid hues of red, purple, and blue popping from the screen in specific wardrobe choices and locations. With that said, these splashes of color are inconsistent, and the majority of the movie features a comparatively drab look. Contrast is good with a pleasing sense of dimension, and black levels are inky throughout. I detected what appeared to be some minor flicker during a few shots, but this was not a major issue. There are several scenes throughout 'Margaret' (particularly early on) that are really quite impressive in high definition, but the overall video presentation is a tad uneven. Still, the transfer is authentic and free of any major issues. The audio is presented in an English DTS-HD MA 5.1 track with optional English SDH and Spanish subtitles. Delicate but artistically effective, the film features a nice mix that helps to enhance the mood and tone of the story. Speech, whether whispered, screamed, or cried, is easy to hear and comes through with crisp fidelity. Effects and dialogue are directionally spaced when appropriate with smooth, natural imaging. Though relatively quiet, the subtle soundstage feels wide, and surrounds chime in with periodic discrete and disperse sounds (traffic, whispers in a theater). Dynamic range is wide, providing an extensive gamut of frequencies (a scene set during an opera is especially impressive). Bass activity isn't much of a factor, but there is some minor rattle well called for. Subtle but enveloping, the mix complements the visuals and narrative nicely. Extended Cut - A separate DVD disc containing a standard definition version of the director's extended 186 minute cut of the film is included. Given all of the controversy surrounding the movie's post-production difficulties, it is interesting to get to see the alternate cut, but would it have been too much to ask for it to be included in high definition as well? Apparently, yes. Yes it would. Of course, I suppose the fact that we get to see this cut at all is a minor miracle. After being trapped in post-production hell for several years, 'Margaret' finally makes its way to Blu-ray. Neither a rousing success, nor a total failure, Kenneth Lonergan's ambitious film features some admirable qualities. Unfortunately, the languid pace, melodramatic tendencies, and disjointed structure mitigate its overall impact. Video quality is a little uneven but mostly good, and the audio mix is subtle but effective. While it's nice to get a bonus, extended cut of the movie, it is sadly only presented in standard definition. My reaction to the film may be decidedly mixed, but it's still an interesting effort.